My second shot at TSHOOT exam was much better. I went to another testing center and did not experience a single glitch. Out of 35-40 questions I got only one wrong. I used Boson's practice exam during the preparation to one of the previous Cisco exams before and was really disappointed. The practice exam was not hard enough and there were few errors, but I was very pleased with their TSHOOT simulator. It is probably even more difficult than real Cisco exam, but no simulator can replace on-the-job experience. I have one last exam left to add CCNP trophy to my CCNA and CCIP. The exam is new Cisco TSHOOT. I've read a lot of good reviews about the exam and demo looks great. The exam has 2 parts: multiple choice questions and tickets. After I finished multiple choice part, exam software crashed throwing some Flash error. I was given another computer and it crashed again in the same place. Kind folks at the testing center spent about an hour on the phone with tech support only to see test exam software crashing again and again with the same Flash error. It looks like Steve Jobs was onto something when he banned Flash from iPad. So, I have to re-schedule the exam and hope that next time it works. 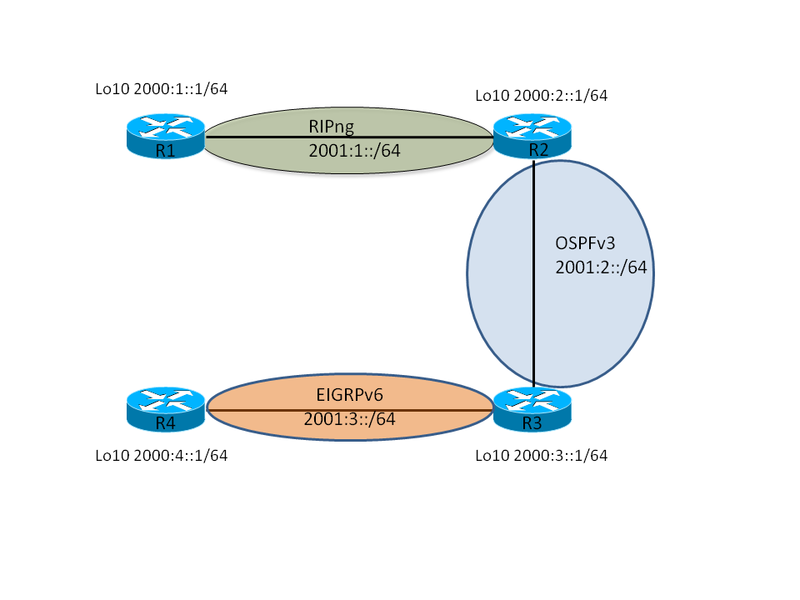 OSPFv3-EIGRPv6 redistribution. Strange "include-connected" behavior. R1 does not have 2001:3::/64 network and R4 is missing 2001:2::/64. 2001:3::/64 is EIGRPv6 network and is supposed to be redistributed into OSPFv3 and then into RIPng. 2001:2::/64 is OSPFv3 network and should be redistributed into EIGRPv6. So, even though "include-connected" is added to "redistribute ospf" and "redistribute eigrp" it does not seem to work. At the same time, on R2, RIPng redistribute connected OSPF networks. Let's add explicit "redistribute connected" statements on R3. So far I was not able to find if this is intended behavior. I recently took and passed Cisco 642-813 SWITCH exam. All those things you might have read about crashing simulators, poorly worded or bad grammar questions are true. In my case sim crashed 3 times when I entered same command, so I simply skipped the command just to continue with the exam. It made task incomplete and cost me few precious points. And do not even try Cisco's practice tests - there are too many incorrect answers to take these tests seriously. All this is not to say that test is impossible to pass, but if you are not in a rush, I'd recommend to wait a few months before taking it. Hopefully, Cisco will clean up its act. If you have not guessed yet, SNMP and monitoring are my favorites. vlanTrunkPortDynamicStatus (1.3.6.1.4.1.9.9.46.1.6.1.1.14) - reports operational state. The attacker can flood your web or email server with UDP fragments causing it to slow down while it is busy discarding incomplete packets. We can not block fragments completely since legitimate DNS replies can be quite big and require fragmentation. The solution would be to allow outbound UDP traffic and, hence, incoming replies only to specific hosts that need it. Like your caching DNS server and put good firewall in front of it. If NetFlow is configured for version 7, the flow is performed by the Routing Processor, which could cause high CPU utilization. For troubleshooting high CPU utilization due to Netflow version 7, configure mls nde sender version 5, as the Netflow export is performed by the SP, which is the default for version 5 or version 9. Default sender version is 7. Both routers configured with ip flow-export version 9.
spikes only happened when eBGP session went down. After changing NDE sender version to 5 on R1, the problem went away. It was "IP Input" which is responsible for process-switching IP packets. Now we have something to work with and can start troubleshooting. Splunk seems to become de-facto standard tool for log management. But free version lacks feature that lets you configure and send alerts whenever certain events occur. One need to pay for enterprise version which starts at $5000 in US and Canada. Here is another template to report all syslog messages coming from devices with loopback interface IP address in the range 10.9.20.0/24 or 10.9.25.0/24. Why loopback? See my previous post. I tend to agree, that there is no "best practices", there are practices that fit best. Here is one of the things that I always configure on the router. Next step is to either add loopback interfaces of your routers to DNS or /etc/hosts file on Tacacs and syslog servers. The names are no good if you can not use them. I prefer syslog-ng for logging, so, in order to record names instead of IP addresses, you need to configure use_dns(yes) in "options" section of syslog-ng.conf. For TACACS+: run tac_plus with "-L" option. Suppose you need to make the same change on many routers, but do not have fancy software like Cisco Works to help you. No worries. Perl is the best friend of any network and system administrator. Here is the quick script that goes to a router and types command "logging source-interface loopback 0", saves configuration and exit. It can be used to run any command. Place IP addresses of the routers, one per line, in file routers.txt. This file must be in the same directory as the script. Remember, you put your username, password and enable password in the script in clear text, so do not forget "chmod 700 "
Normally, installing Debian on Dell servers is piece of cake. This particular 1950 came with Broadcom NICs and PERC5 controller. Debian 5.0.4 does not include driver for Broadcom drivers due to some copyright restrictions. However, the driver is available as deb package. Download it and copy to FAT or FAT32 formatted USB drive. When prompted for NIC driver during the installation process, insert USB drive into USB port. As soon as server loads the driver and moves to the next screen in installation process, remove the drive. If you do not remove the USB drive before installation process gets to partitioning, your drive sequence will we out of whack. You'll have to boot from CD and edit /etc/fstab. Since this server has hardware I wanted to use instead of configuring software RAID in Linux. The question is how to monitor RAID state from Debian. There is no deb package or source code, but LSI provides RPM. I downloaded "MegaCLI - Linux" from "Miscellaneous" section, unpacked it, installed "alien" on Debian (sudo apt-get install aliean) and then "sudo alien -i MegaCli-1.01-0.i386.rpm". It install MegaCli under /opt/MegaRAID/MegaCli. Moritz Mertinkat has great emergency cheat sheet for MegaCli usage. I use Cacti to collect traffic data on my routers and I need to know what 95th percentile is. There are quite a ways to get 95th percentile line on Cacti graph. The problem with all those methods is that if time frame of the graph does not coincide with ISP billing period the 95th percentile value on the graph is useless. But all the necessary data is collected by Cacti into RRD file. All we have to do is to extract it. where border_router_1_traffic_in_14839.rrd is file name from previous step. The data sources names are traffic_in and traffic_out and this is what we are going to extract. Before we proceed we need to remember, that RRD database size is fixed and determined at the time of creation. When limit is reached, oldest data is overwritten. To avoid losing any data, I am going to extract traffic numbers every hour for the last hour and put inbound and outbound data in separate files. This are measurements taken every 5 minutes by Cacti. "6.9655133612 7" means 6.9655133612 * 10^7 bits/sec or 69655133.612 bits/sec.